Allergen Advice: Contains Wheat, Soybean, Fish. Also contains egg, peanut, milk and shrimp. 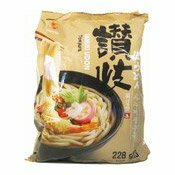 Ingredients: Noodles: Wheat Flour, Modified Tapioca Starch (E1442), Enzyme (Lipase), Refined Salt, Water, Acidity Regulators (E260, E575, E350, E270, E325). Liquid Soup: Refined Water, Soybean Sauce, Refined Sugar, Refined Salt, Anchovy (Fish) Powder, Dextrin, Bonito (Fish) Powder, Sea Tangle, Flavour Enhancers (E631, E627), Flavour Enhancers (E631, E627, E350, E364), Flavour Enhancer (E631). Dried Solid Soup: Fritters, Fried Bean Curd, Dried Green Onion, Dried Seaweed. Simply enter your details below and we will send you an e-mail when “Sanuki Udon (Tempura Flavour) (烏冬麵 (天婦羅))” is back in stock!